Each year Australia and New Zealand compete against each other for the Wayleggo Cup. Each country takes it in turn to host and organise a test series. The Wayleggo Cup was first presented by the New Zealand Sheep Dog Trial Association in 1994 for the Trans Tasman competition. Inspired by Tony Shield, the President of the New Zealand Sheep Dog Trial Association at the time. The term ‘wayleggo’ is an abbreviation for the ‘come away and let go’ command used by musterers and shepherds in New Zealand to call their dogs back from the stock they are working, usually over a very long distance. Australia is the current holder of this cup. Having won in New Zealand in 2005 (their first win in New Zealand) and successfully defending at Narrandera in 2006. Each series consists of two tests, and the country with the highest combined aggregate wins the Cup. Each team is made up of four competitors, with each country having a selection process to determine the team members. In Australia, the two best performing dogs from each of the six states compete against each other over three rounds, two of which are held on a Trans Tasman course. The four competitors with the top aggregate scores then become the Australian Test Team for the succeeding test series. The NZ Team is chosen from among the finalists at the North/South Island & NZ Championships. The competition started in 1985 as a competition between New Zealand and Queensland. 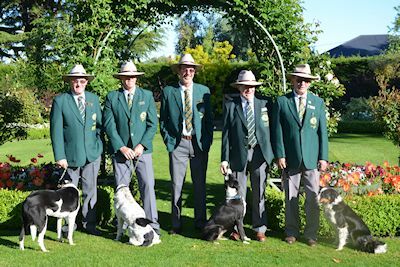 The Australian Sheepdog Workers’ Association was formed in 1988, and from 1990 assumed responsibility for the Trans Tasman competition, holding this event at Deloraine in Tasmania in 1990. The competition is conducted over a special course with its own rules, developed specifically for the Trans Tasman competition. It is a mix of both Australian and New Zealand rules. The Trans Tasman course consists of 4 obstacles – a gate, a Maltese cross, a ramp and a pen. Australian rules apply as far as the gate, followed by a NZ drive through the Maltese cross and over the ramp, then back into an Australian carry to the pen. In the New Zealand sections competitors are allowed to assist their dog more than in the Australian section, thus showing their stockmanship skills. The course must be completed in 15 minutes. There are two judges, one from each country, whose scores are averaged. The Australian Trans Tasman team in 2013.